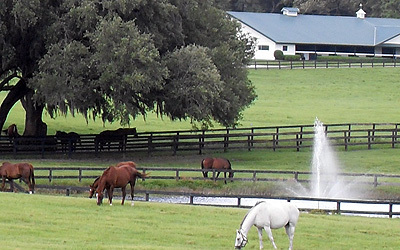 North Central Florida (NCF) is one of the most beautiful areas in the state with rolling hills, live oak hammocks covered in Spanish moss and a diverse variety of plants and trees. The mild climate with distinct season changes allows for leaves to change colors in the fall and occasional temperatures of below freezing in the winter. The University of Florida (UF) is in Gainesville, Florida. UF is the largest university in the state and a source of higher education with national recognition. It is known for its medical, veterinary and colleges of education. Additional institutions of education include Santa Fe College, Central Florida Community College, and Saint Johns River Community College. North Central Florida is also known for advanced state-of-the-art health care. Advanced medicine is offered by several top-notch facilities that include Shands Hospital at the University of Florida, North Florida Regional Medical Center, and Nature Coast Hospital. Transportation and accessibility to all areas is provided by I-10 and I-75, Gainesville Regional Airport, Amtrack Train Station, and The Greyhound Bus Station. Local sports can be found at the University of Florida, which features Gator football, basketball, baseball and gymnastics. Theatrical entertainment can be found at the Center for Performing Arts, the Hippodrome, and local theater houses. Night life is found in pubs, bars, and dance clubs. Restaurants include many ethnic options, and everything from local diner/eateries, BBQ, to national chains. The many small towns dotting the landscape in NCF each have a unique history all their own. Some of the towns include Micanopy, Alachua, Newberry, High Springs, Trenton, Chiefland, Williston, Cedar Key, and Suwannee. Each small town offers a variety of bed and breakfast options, historic streets with original buildings, unique stores, antique shops, farmers’ markets, and flea markets. The small towns feature seasonal festivals (e.g., the Newberry Watermelon Festival, Cedar Key Crab Festival, and Williston Peanut Festival). 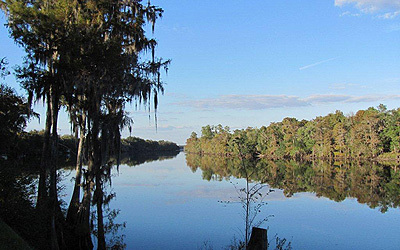 North Central Florida is known for an abundance of water and state parks. The area encompasses the Gulf, Suwanee, Santa Fe, and Itchetucknee Rivers, various lakes, and springs. The variety of water and undeveloped land in state parks allows for abundant water sports and recreation, fishing and hunting. Florida was inhabited by Paleo-Indians as early as 14,000 years ago. The earliest known European explorers came with the Spanish conquistador, Juan Ponce de Leon, in 1513. Ponce de Leon named the newly discovered land “La Florida” due to it’s abundance of flowers that were in bloom upon his arrival in Spring. Over the following century, the Spanish and French established settlements in Florida. Soon after, the English colonists arrived. Great Britain established control of Florida through the Peace Treaty of Paris in 1763. It then shifted back to Spain after the Revolutionary War and was controlled by American forces after the First Seminole War. Florida became the 27th state in 1845.